ICMR in collaboration with PGIMER, Chandigarh will hold a National Level Examination for the award of Junior Research Fellowships (JRF), for Indian national candidates at Chandigarh, Chennai, Delhi, Kolkata Mumbai,Guwahati and Hyderabad on Sunday, July 18th, 2010. 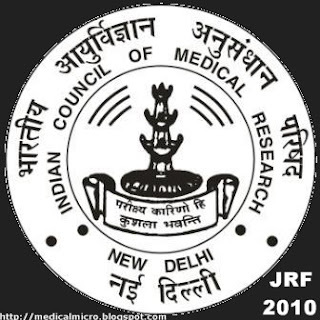 A total of 150 Fellowships would be awarded; 120 fellowships awarded in Life Sciences stream (like Microbiology, Physiology, Molecular Biology, Genetics, Human Biology, Biotechnology, Biochemistry, Bioinformatics, Biophysics, Immunology, Pharmacology, Zoology, Environmental Sciences, Botany, Veterinary Sciences etc), and thirty (30) fellowships in Social Sciences stream (like Psychology, Sociology, Home Science, Statistics, Anthropology, Social work & Health Economics ). Application form duly completed must reach the Registrar; Academic Section PGIMER, Chandigarh-160012 by registered/Speed post on or before 28.04.2010. Candidates from remote areas /regions may submit their application forms duly completed latest by 03.05.2010. Educational: M.Sc/M.A or equivalent degree with minimum 55% marks for General/OBC Candidates and 50% for the SC/ST & Physically Handicapped (PH) candidates in the subjects mentioned above. Candidates appearing in the final year examination (2009-2010) can also apply. Age Limit: The upper age limit for admission to the eligibility test is 28 years as on 30-09-2010 (relaxable up to 5 years in case of candidates belonging to SC/ST/PH/ female candidates and 3 years in the case of OBC. Information bulletin containing the application form and other details will be available here.